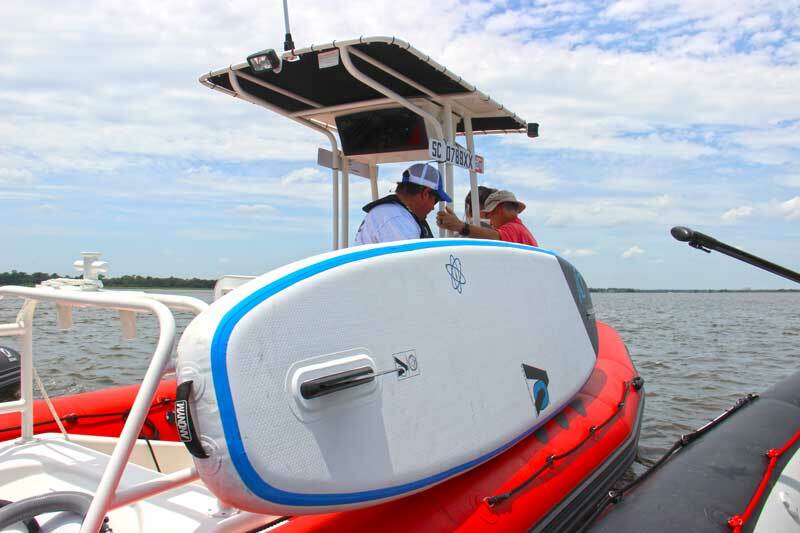 The new Zodiac Open 5.5 RIB made its U.S. debut in Charleston, SC, in June, and we took the opportunity to fly down and test it out on the water. This is the latest RIB from Zodiac-Nautic. The company also produces the N-ZO, Medline, and Pro, among other lines, as well as classic tenders. Zodiac’s Americas plant is based in Summerville, SC, so we also had the chance to tour the facility where some of these boats are produced. One thing that struck us right off the bat: the boating industry is booming in South Carolina. Practically next door to the Zodiac plant is Scout Boats, among others, and all of these manufacturers manage to keep a healthy and even helpful working relationship. 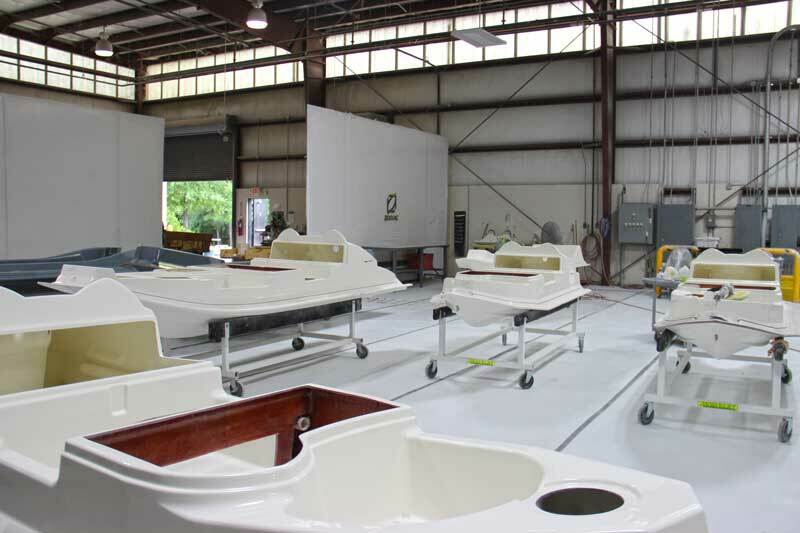 While touring the Zodiac facility, being able to see boats in each part of the build process helped to convey the quality and durability of the brand before getting out on the water for sea trials. 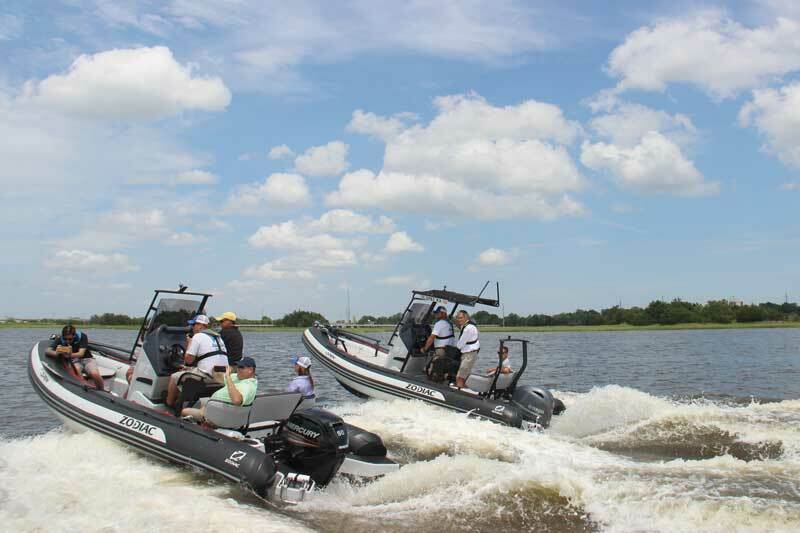 While cruising along the Ashley River, past the city docks, and around Fort Sumter, you could really feel the stability and versatility of these RIBs. The Open 5.5 offers a perfectly ergonomic cockpit and an exceptional reinforced deep-V hull, with control and stability even in rough conditions. It was a beautiful, sunny day with calm seas for our trials, but we could create some waves by crisscrossing each other’s wakes, and these boats took everything we threw at them. Even sitting on the bow seat while hitting waves was comfortable; you barely registered the wake. At nearly 18 feet long and eight and a half feet wide, these boats are equipped to hold up to 12 passengers. This number may seem high for a smaller boat, and it would be for a casual cruise, but in a rescue situation, I don’t doubt it could handle it. Max speed is 40 knots. Demoing the Zodiac Open 5.5's on the Ashley River. One perception the folks at Zodiac are trying to change is that RIBS can be easily punctured; that if you bring your dog onboard its claws will puncture the tubes. But that is simply not the case. These boats are made of quarter inch thick laminated PVC with five airtight compartments, separated by waterproof partitions. Because of this, the boat keeps its ability to float and stays conceptually unsinkable when fully loaded, even with a deflated compartment. As mentioned during our factory tour, the Coast Guard, the military, and numerous other agencies wouldn’t take these boats out into the North Atlantic if they couldn’t handle it. We also had the opportunity to demo Zodiac's new inflatable SUPs. Thanks to their versatility, rigid-hulled inflatables have come to be known as the “4x4 of the sea.” During our trials, each Zodiac was configured slightly differently, whether for fishing, diving, or family cruising, so we could see the many options available to boat owners. Some features and add-ons include: a removable back rest on the cockpit which can be configured with rod holders, an integrated 14 gallon cooler under the back bench, an extra-large box console with a locking door and capacity for wakeboards or other water toys, optional rear dive platform, T-Top, bow sundeck extension, tow bar, and a premium swim ladder. Regardless of the water activities you plan to do, this boat should be able to accommodate them. Another bit of news: this spring Zodiac Nautic announced the acquisition of Anonym SUP, a renowned designer and manufacturer of stand up paddleboards based in France. The strong industrial, technical, and business synergies between the two companies will allow Zodiac to broaden its product catalog and immediately offer innovative SUPs at its dealerships worldwide. There are two options available: the Explorer (MSRP: $859) and the Pocket (MSRP: $759). At 11 feet long, the Explorer is designed for sport paddling or surfing, and due to its longer length, it is very stable for an inflatable board. The Pocket measures in at eight feet, making it good for beginners and SUP yoga.